Shopping for Angry Birds Construction Toys? Send the birds into Pig City and get the eggs back! Use the catapult to shoot Red and Stella into Pig City! Cause a chain reaction by firing the birds above the boulder, and use the piggies’ own TNT against them! Chase the piggies all over Pig City to get the eggs back, but keep your eyes peeled for the sliding piggy in his umbrella! Will the birds even find their eggs in all this piggy-crashing excitement? Includes 4 figures: Red, Stella and 2 piggies. Pig City features a zip line, hot dog stand, small house and a falling boulder. 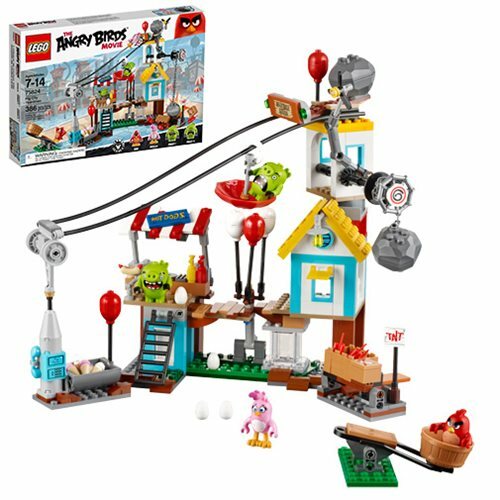 Accessory elements include a catapult for the birds, umbrella, 5 eggs, 3 sticks of TNT, TNT storage box, 5 balloons, hot dog plus ketchup and mustard dispensers, and a ladder. Includes 386 pieces. From ages 7-14.